Many Ah! 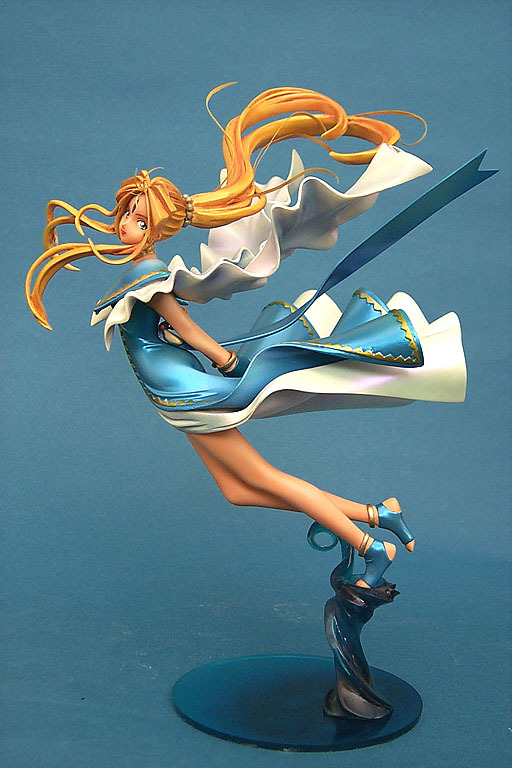 Megamisama kits are very pretty, especially those of Belldandy. However I have a thing against building them – isn’t a big fan of Bell-chan (thought she’s a bit too submissive) and most kits have relatively little skin 🙂 But since I started using pearl colors extensively, I can finally do some cool things with the costumes. So here goes my first Bell-chan kit! She’s my new front page gal. This kit is a mixed bag. Some of the stuff was done well and some pretty badly. The casting on the clothing, especially the “sleeves”, could be better; there is a lot of rough spots on these areas – tedious to clean up. The fit however was almost perfect. I’d have given part break a 5 if not for the sleeves – they attach to the main shoulder area by surface only, there’s no way to pin, so it was a stability concern. The main problem with the kit however is the details. The sculptor seems amateurish, the hair was a bit lacking in detail and the strands got munched into one another. She also don’t have her trademark hair bang, so I needed to add that myself. The yellow triangles on her suit has very high relief which isn’t a major concern, but it’s weird regardless. Finally the clothing shoulder/chest area doesn’t really make sense, if you see art of Bell-chan they’re wrapped tight, but here is a strange platform-like extension. The pattern there is supposed to be two rows of upward and downward right-triangles, here we get one row of equilateral ones. Her clutching hands was also a bit simplistic. The “tail” on the back was supposed to be rooted by feathers, but we get some weird looking pickles. Finally I think her nose is a bit to the right – makes her front view look somewhat unparallel… fortunately it’s not immediately noticable. These are all minor problems and don’t ruin the kit, but I wish they were done better. I had a hard time deciding what pearl color I want on top of Bell-chan’s blue parts – green or blue? Finally I settled on blue. The white parts are given a coat of violet pearl, you can see traces of them in the pictures above. The effect is more prominent in person – seems like these colors shows up much better in low exposure. I painted the yellow triangles gold with a coat of clear yellow on top. To be honest I only did it because I hate masking – gold is a very opaque color and hand paints extremely well. But it turns out to be a good choice. As for the hair, Bell-chan was shown with many different color, blonde, yellow, brown, brown grey… I use a yellow/brownish theme this time. Using a dull yellow base coat, I airbrushed clear brown for shadows and a clear yellow/orange mixed in brillant gold powder for highlights. The powder is excellent, it gives her hair that blondy shine but doesn’t overdo it. If I had painted straight gold on top it’d have looked like gold and that’d be weird. As mentioned in the Review section, the kit was lacking in details, so I added quite a few hair strands to make up for that. The earrings are as difficult to make as usual, they casted them on a piece of resin and you have to cut the relief out. Needless to say I screwed up – the “rings” of her earrings are very very thin and so one of them got damaged. After a lot of hassle I fixed them, but they weren’t very visible, what a waste. The water swirl she stands on is cast in clear blue resin; I wish they cast it in plain clear so that I shade it. Oh well. The base I painted an ordinary acrylic circle with clear blue. I tried to create some relief on it so that it looks somewhat like waves (didn’t have the patience to generate a full waterbed), so I jabbed the brush around a wet coat of clear blue, and after it dries I sprayed more clear blue and brushed a heavy coat of future. I think it turns out ok, better than a plain blue piece of plastic, but of course not as good as diorama water.